Carnival of Space #247 is now up at the Next Big Future. There's drinking coffee in zero gravity, double stars, asteroid mining and much, much more. Head on over for a read. Nova Sagittarii 2012 (PNV J17452791-2305213) turns out to be visible in images taken with the STEREO B satellite. Over a his blog, CometAl has an animation of the nova brightening assembled from STEREO B images. William Thompson of NASA has used the STEREO images to construct a light curve. This is a fantastic use of these wonderful satellites. 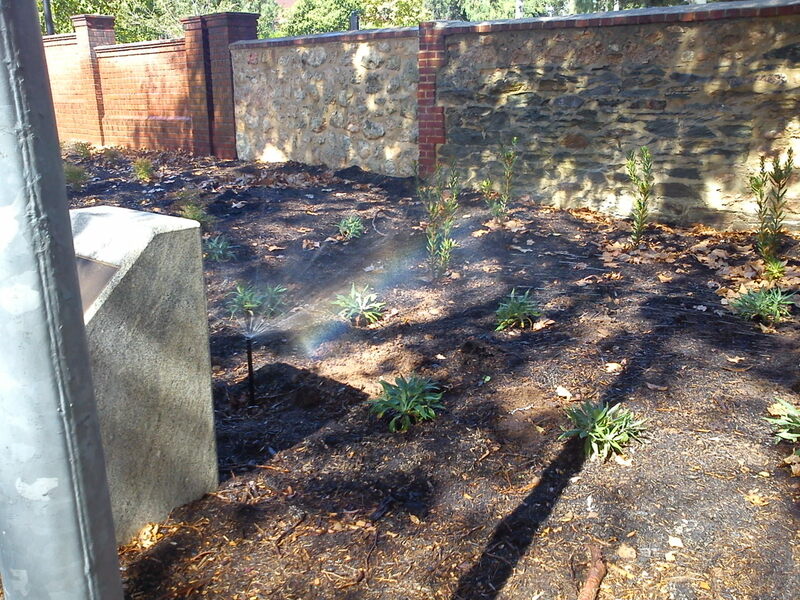 The Bettdeckererschnappender Weisle has just returned from here trip to the USA, where she shared information on how to educate communities about bushfire risk. She brought back loads of presents (I'm not worthy), I got a t-shirt dyed with colours that come from coffee beans, EldestOne got a T-shirt whose colours come from volcanic ash and the two others got "Angry Birds" hats. The outstanding present was an "iHelicopter" a toy remote control helicopter you can run from your iPad, iPad or iPhone. MiddleOne, who is slowly building a remote control plane, is having great fun. But everyone else is getting a go too. I'm very good at smashing it into the ceiling. I also got an Olympus SZ-14. It has a fantastic 24x optical zoom, selectable ASA ratings, and a whole bunch of other useful features. The only thing that it lacks is user selectable shutter speeds. Still, this will go into my bushwalking/astrophotography reasonably priced cameras group. Should be great for lunar eclipses and twilight Venus. Carnival of Space #246 is now up. Carnival of Space #246 is now up at Links Through Space. There's propelling spacecraft with the quantum vacuum, mining asteroids, the last flight of Discovery, TargetAsteroids!, high school students hunting asteroids and much, much more. 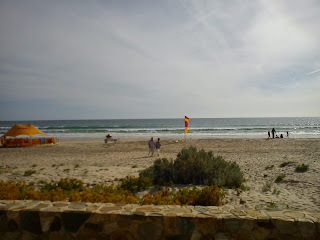 Pop on over and have a read. The First Quarter Moon is Sunday April 29. 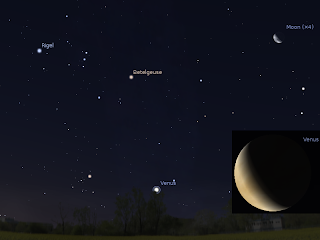 Venus is still easily visible in the western evening sky close to the star Elnath. Jupiter is very close to the horizon and difficult to see. 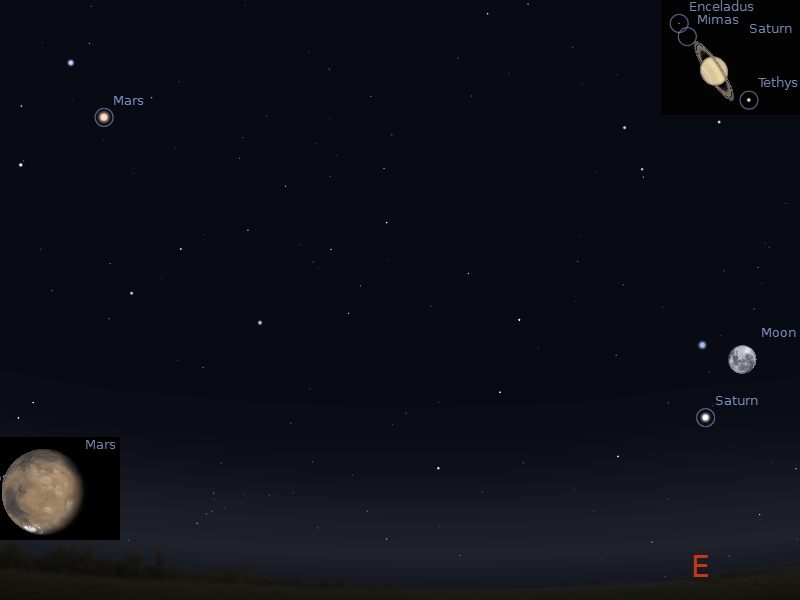 Mars is in the eastern evening sky, close to the bright Star Regulus. It is visited by the waxing Moon on May 1. Saturn is visible the whole night long near the star Spica. Mercury is visible in the morning sky. Comet Garradd is in the northern sky. 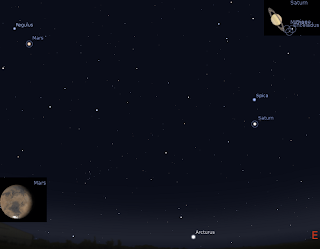 Evening sky looking North as seen from Adelaide at 7:00 pm local time on Tuesday May 1 showing Mars, Regulus, Saturn and Spica. Similar views will be seen elsewhere at the equivalent local time. The inset shows the telescopic appearance of Mars, Saturn and it's Moons at this time. Click to embiggen. The First Quarter Moon is Sunday April 29. Mars is in the constellation of Leo. It is the brightest object in the northern sky, and its distinctive red colour makes it easy to spot. Mars is rising before sunset and is at its highest in the northern sky around 9 pm. 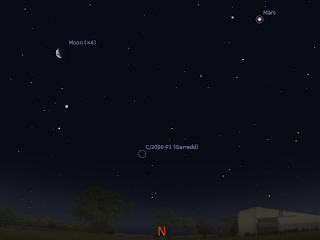 On May 1 Mars is close to the waxing Moon. Mars is close to the bright star Regulus in Leo. However, it moves away over the week. Saturn is above the north-eastern horizon, not far from the bright star Spica. Saturn is high enough in the north-eastern sky for telescopic observation in the late evening, rising before 6 pm local time. Saturn was at opposition, when it is biggest and brightest as seen from Earth, on the 16th of April, but now is still a great time for telescopic views of this ringed world. 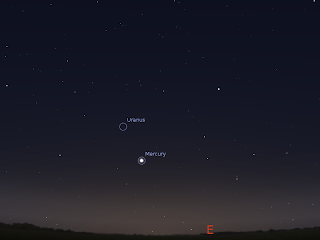 Mercury is now visible above the eastern horizon by 5:00 am in the morning. Now is the best time to see this speedy world in the morning. Mercury now begins to sink towards the horizon, but is still easily visible this week. Bright white Venus is readily visible in the evening western twilight sky from around half an hour after sunset for around an hour and a half. Venus continues to pass through Taurus this week and is draws further away from Jupiter. It comes close to the star Elnath, and becomes one of the tips of the horns of the Bull. 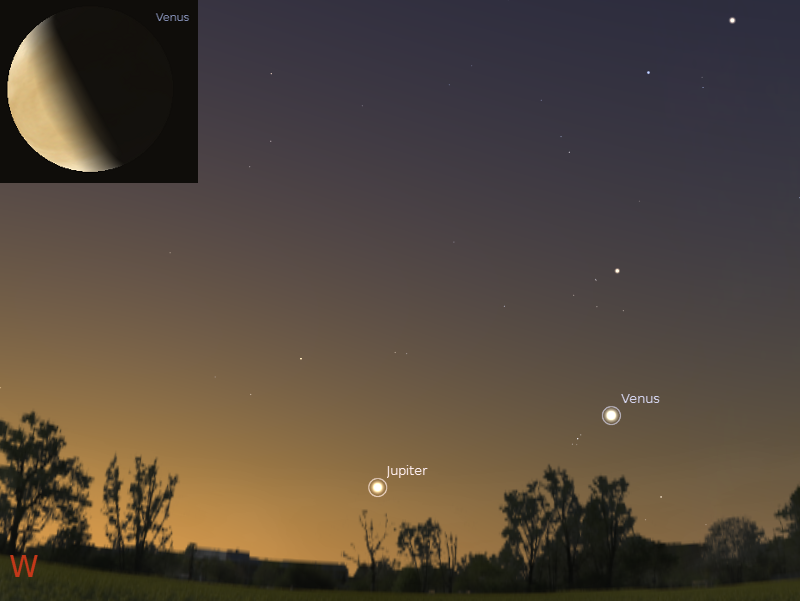 Venus is slowly sinking towards the horizon, and will become more difficult to see. It is a distinct crescent in even small telescopes now. Observation of Jupiter is now very difficult. Jupiter is very low to the horizon, and is quickly lost in the twilight. Comet C/2009 P1 Garrad as seen from Adelaide at 7:00 pm local time. Comet Garrad is rising higher in the northern sky. At magnitude 7, it is observable in binoculars, it's still relatively low to the horizon and the effects of light pollution means that the best views are in strong binoculars or telescopes under dark sky condition. As the week progresses it will rise further above the horizon, improving its visibility. However, as the week progresses the waxing Moon will begin to drown the comet out. NASA has announced new citizen science project called Target Asteroids! where it will recruit amateur astronomers to monitor asteroids to support the OSIRIS-REx asteroid mission (which amongst other things will return wit a sample of asteroid). You can read the press release here, and go direct to the Target Asteroids! site here. The Lyrid meteor shower is on right now (and last night). Here in Australia it's pretty blah with the radiant so close to the horizon, but even that view was denied me and many others due to cloud (you guessed it). However, there is a new meteor resource of all you meteoroholics, the NASA Meteor Watch facebook page. Head over now for meteroic goodness. 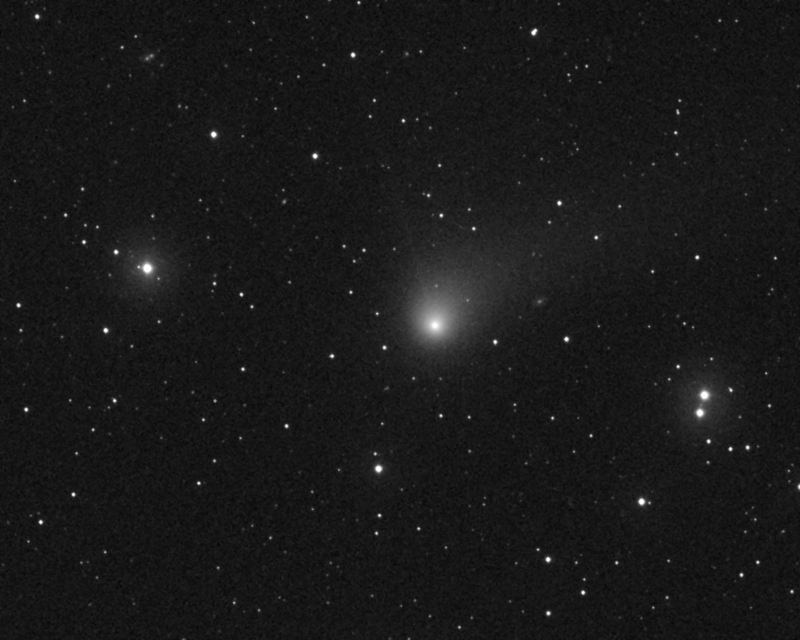 Comet C/2009 P1 Garradd imaged with iTelescope T14 on April 17. Stack of 5 images stretched in FITS liberator, then stacked in ImageJ,despeckled then cropped. The ion tail visible in the image from the 11th is no longer well defined. Along with flying solo while my beloved life partner swans around in the US teaching people how to teach people to survive bushfires (yes, you read that right) lousy weather has made imaging comet Garadd somewhat erratic (waves to Rolando Ligustri), plus EldestOne has used up all our high speed internet downloading games and whatnot, so downloading my images c r a w l s p a i n f u l ly. Therefore, as well as my usual slackness backlog, I have a long imaging backlog and STEREO backlog. Hopefully in the coming week I can get some more imaging processing done. I am being interviewed on ABC Radio 702 tonight (Friday 20 April) at 9 pm AEST (8:30 pm ACST) about a recent column I did at The Conversation; Death by Caffeine. My umms and ahhs will be hear all over the Emerald City. The New Moon is Saturday April 21. Venus is easily visible in the western evening sky close to the Hyades cluster. 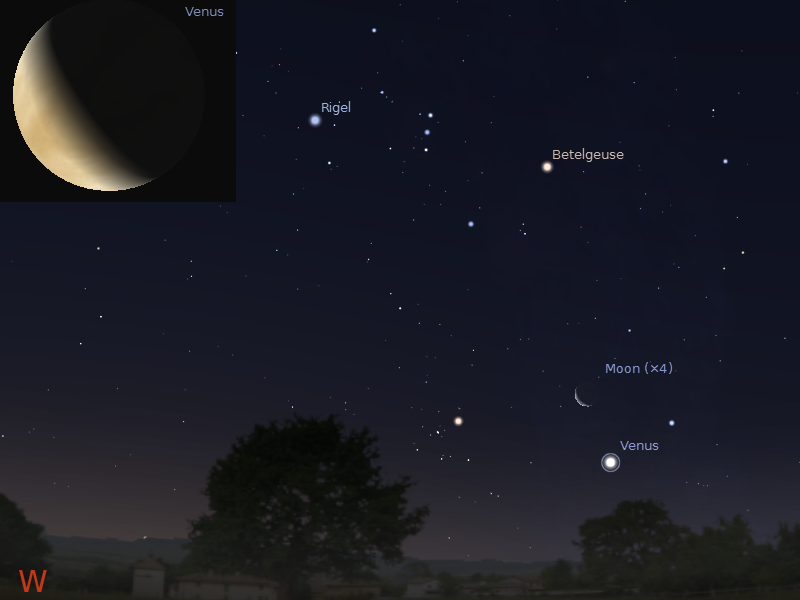 On the 24th and 25th the thin crescent moon is near Venus. Jupiter is very close to the horizon and difficult to see. 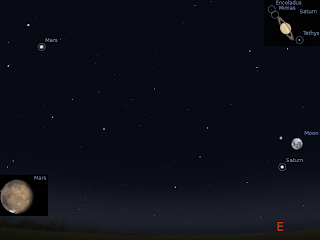 Mars is in the eastern evening sky, close to the bright Star Regulus. Saturn is visible the whole night long near the star Spica. Mercury is visible in the morning sky, and on the 19th it is close to the thin crescent Moon. Comet Garradd in the northern sky. 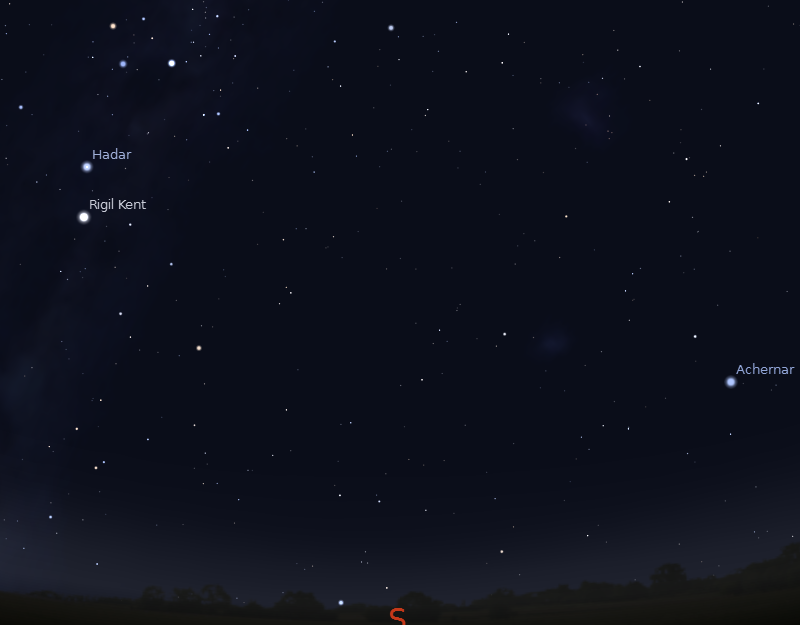 Evening sky looking North as seen from Adelaide at 9:00 pm local time on Saturday April 21 showing Mars, Regulus, Saturn and Spica. Similar views will be seen elsewhere at the equivalent local time. The inset shows the telescopic appearance of Mars, Saturn and it's Moons at this time. Click to embiggen. The New Moon is Saturday April 21. Mars is close to the bright star Regulus in Leo. However, it begins to move away now. Saturn is above the north-eastern horizon, not far from the bright star Spica. Saturn is high enough in the north-eastern sky for telescopic observation in the late evening, rising before 6 pm local time. Saturn was at opposition, when it is biggest and brightest as seen from Earth, on the 16th, but now is still a great time for telescopic views of this ringed world. 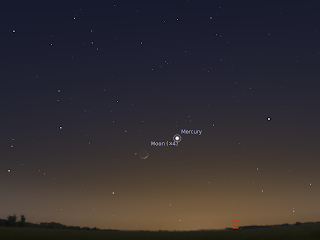 On the 19th, Mercury reaches the highest it will get above the horizon, and is visited by the thin crescent Moon. Venus continues to pass through Taurus this week and is draws further away from Jupiter. 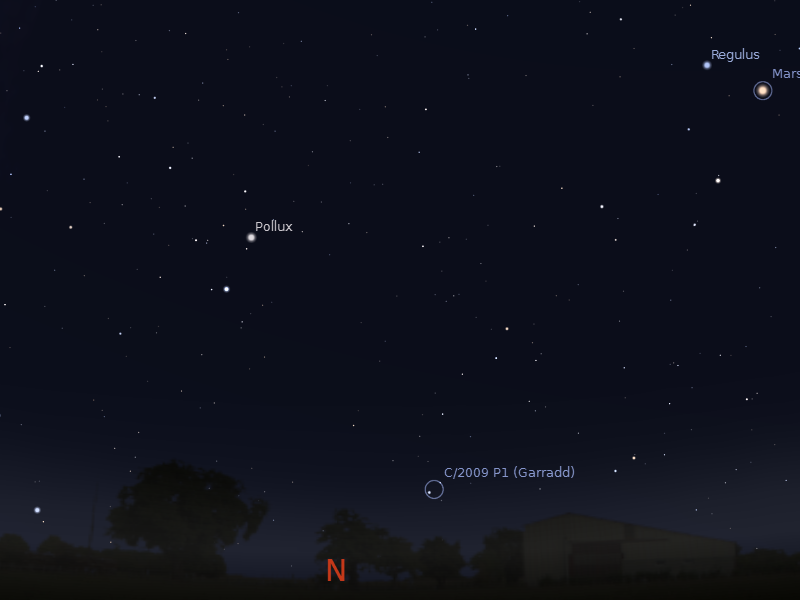 With Mars past opposition and Saturn rising and coming closer to opposition, there are lots of interesting things in the sky to view with a telescope. If you don't have a telescope, now is a good time to visit one of your local astronomical societies open nights or the local planetariums. Carnival of Space #245 is here. Carnival of Space #245 is now up at Vintage Space. There's the meaning of "Jansky", the Musket Ball Cluster, merging galaxies, more Kepler exoplanet news and much, much more. Head on over for a read. I finally made and mounted my pinhole camera for the Solargraphy project. In the end getting the cans was the hardest bit. We are not a big carbonated beverage family, and we rarely by cans of drink so it took a little while to get some cans, and the the BDEW thew them out! Collected a second lot, and the BDEW threw them out again!! So the final time I hid them, then I, my kayaking mate up the road, and his kids (mine didn't want to be involved :-( made pinhole cameras and put in the special film. I've mounted mine high up, so I can get a good horizon effect, but taping the can while trying to level out the pinhole and balance on the ladder was, umm, challenging. Now I just have to wait until 28 May to see how it came out. This week is (14-20 April) is International Dark Sky Week, part of Global Astronomy Month. Don't forget to fill out a light pollution survey for Globe at Night, follow the Australian GAM facebook page, or visit the IceInSpace GAM page. Also check out what your local astronomy club is doing. Diplodicus fossils at Adelaide Airport. The Bettdeckererschnappender Weisle is off to the USA for a fortnight for conferences and work stuff. 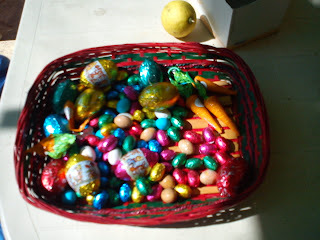 Blogging may be a little thin over the next week or so. 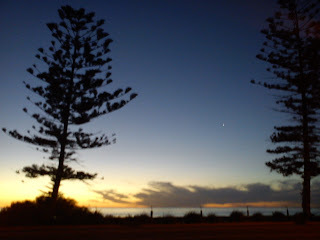 Venus (and Jupiter, but it didn't come out) above the horizon and a lovely sunset, taken with my mobile phone. 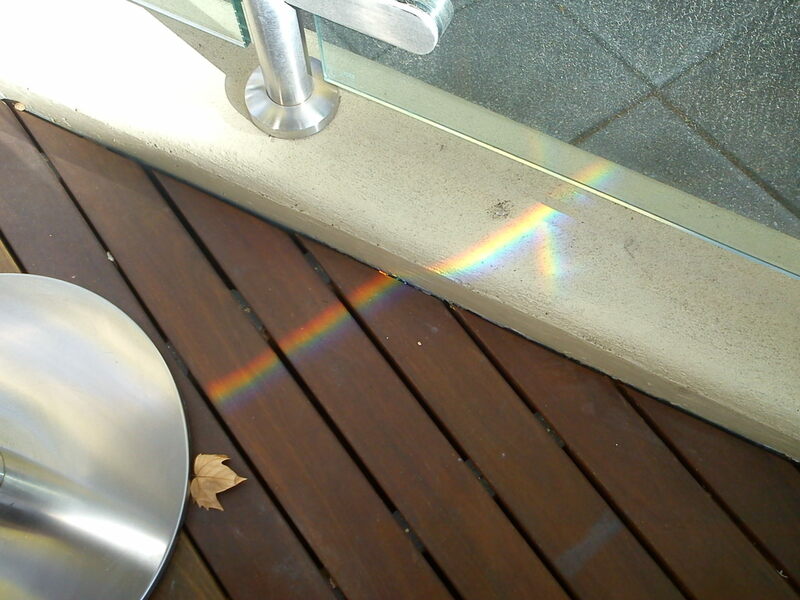 A nice two way rainbow. Comet C/2009 P1 Garradd imaged with iTelescope T14 on April 11. Single image stretched in FITS liberator and despeckled then cropped. Not my best image but cloud interfered. Even so you can still see the ion tail. Yuri's night is a celebration of the first human launched into space. There's a whole range of celebrations, including a movie of the first flight with a livestream starting at 6:00 UT. 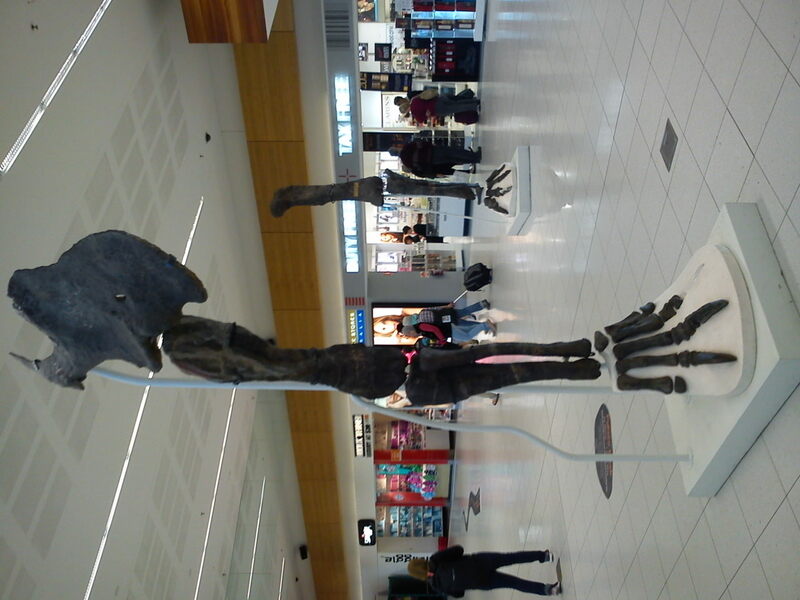 There are lots of events in Australia, including Adelaide. Unfortunately, I'll be home that night, but I'll join you in spirit. 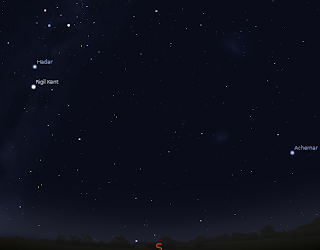 Southern sky at 8 pm local time in Australia showing Crux. Globe at Night, the international light pollution survey, is running its forth survey this year from April 11-20. Visit their website for easy to follow instructions and charts to estimate how dark your sky is. Basically, an hour or so after sunset (8-10 pm) head out, look to the north to find Leo, (if you are in the northern hemisphere) or south to find Crux (for us southern hemisphere types) or Orion (for everybody, but it's getting a bit low) then check how many stars are visible, and report your observations. It's a great excuse to get outdoors and look at the sky. You might even see the International Space Station or an Iridium flare. The Last Quarter Moon is Friday April 13. 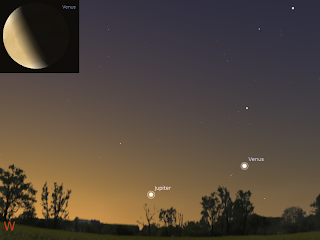 Venus is easily visible in the western evening sky close to the Hyades cluster. Jupiter is very close to the horizon and difficult to see. 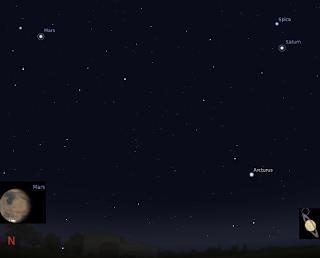 Mars is in the eastern evening sky, close to the bright Star Regulus. Saturn is at opposition on the 16th. It is in the late evening eastern sky near the star Spica. 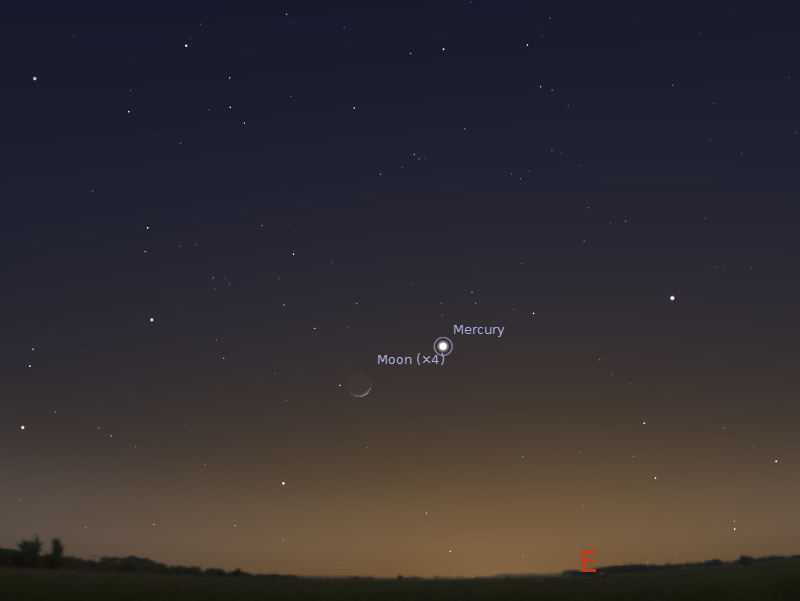 Mercury returns to the morning sky, and on the 19th it is close to the thin crescent Moon. Comet Garradd in the northern sky. 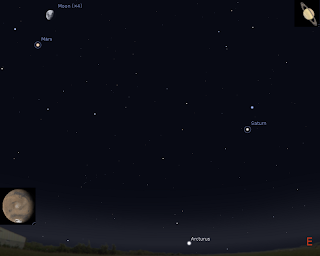 Evening sky looking east as seen from Adelaide at 8:00 pm local time on Monday April 16 showing Mars, Regulus, Saturn and Spica. Similar views will be seen elsewhere at the equivalent local time. The inset shows the telescopic appearance of Mars, Saturn and it's Moons at this time. Click to embiggen. The Last Quarter Moon is Friday April 13. 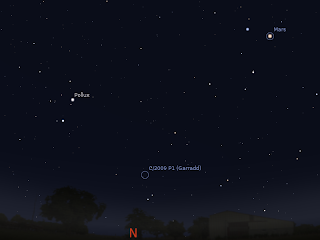 Mars moves closer to the bright star Regulus in Leo with the pair being closest on the 16th. Saturn is above the north-eastern horizon, not far from the bright star Spica. Saturn is high enough in the north-eastern sky for telescopic observation in the late evening, rising before 6 pm local time. Saturn is at opposition, when it is biggest and brightest as seen from Earth, on the 16, and now is a great time for telescopic views of this world. As the week progresses it will climb higher in the morning sky. On the 19th, it reaches the highest it will get above the horizon, and is visited by the thin crescent Moon. 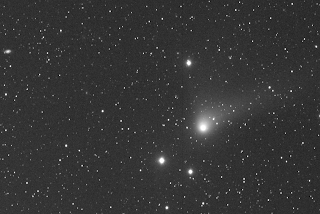 Comet Garrad has entered the northern sky. At magnitude 7, it is observable in biocuars, but it's location low to the horizon and the effects of light poluution means that the best views are in strong binoculars or telescopes under dark sky condition. As the week progresses it will rise further above the horizon, inporving its visibility. Carnival of Space #244 is here. Carnival of Space #244 is now up at the Next Big Future. There's property rights in space, a near twin of our solar system, telescope adapters for iPhones, magnetic monopoles and much more. Go have a look now! Head over to Comet Al's for an Unexpected Rainbow. 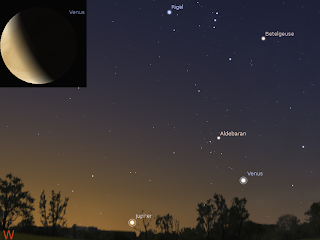 Evening sky looking west as seen from Adelaide at 6:30 pm local time on April 25 showing Venus near the crescent Moon. Similar views will be seen elsewhere at the equivalent local time. Click to embiggen. 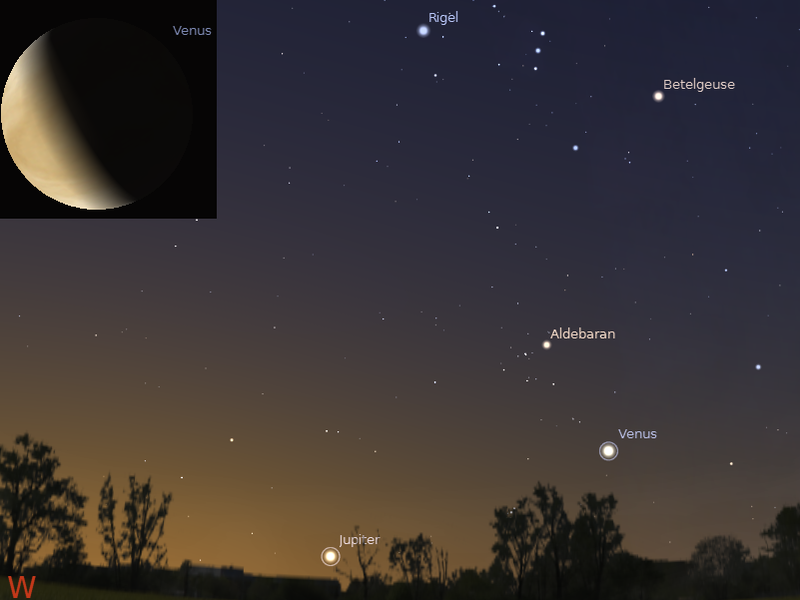 Venus is prominent in the early evening sky. Venus is close to the crescent Moon on the 25th. 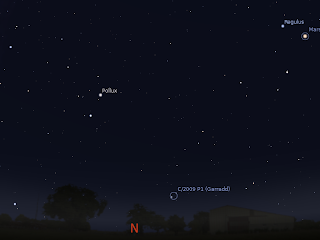 Jupiter is low in the early evening sky, and is lost in the twilight towards the end of the month. 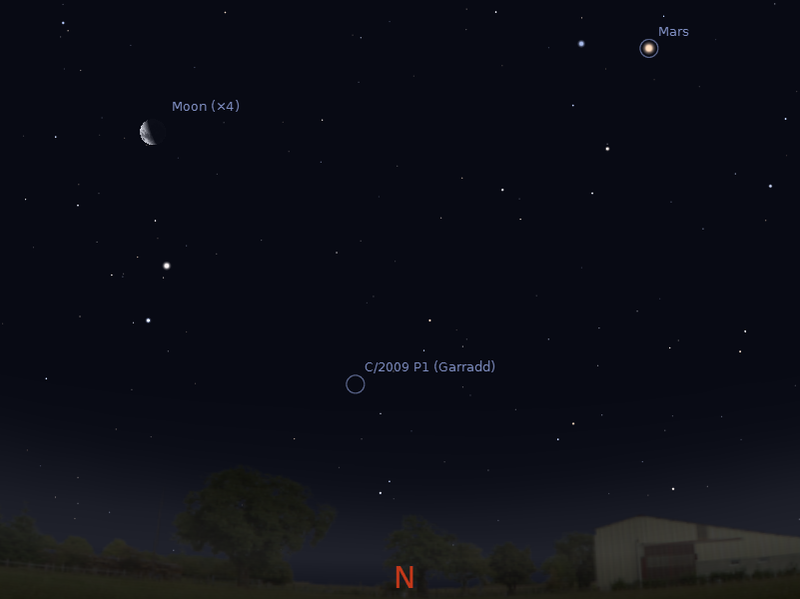 Mars is close to the Moon on the 3rd, and closest to Regulus on the 16th. Saturn is at opposition on the 16th, and is close to the Moon on the 7th. 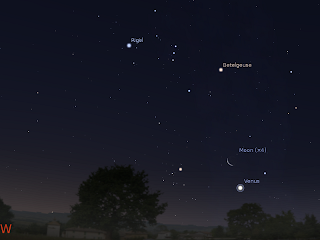 Mercury returns prominently to the morning sky and is close to the crescent Moon on the 19th. Evening sky looking east as seen from Adelaide at 7:30 pm local time on Saturday April 7 showing Mars, Regulus and the Moon forming a triangle with Saturn and Spica. Similar views will be seen elsewhere at the equivalent local time. The inset shows the telescopic appearance of Mars, Saturn and it's Moons at this time. Click to embiggen. The Full Moon is Saturday April 7. 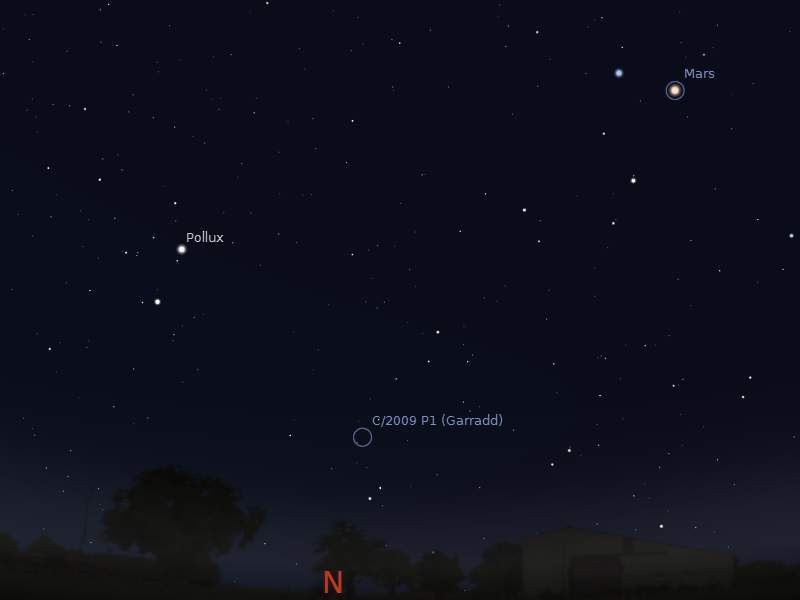 Mars moves closer to the bright star Regulus in Leo. Saturn is above the north-eastern horizon, not far from the bright star Spica. Saturn is high enough in the north-eastern sky for telescopic observation in the late evening, rising before 7 pm local time. Saturn will be at opposition, when it is biggest and brightest as seen from Earth, next week, but is still a great target now. 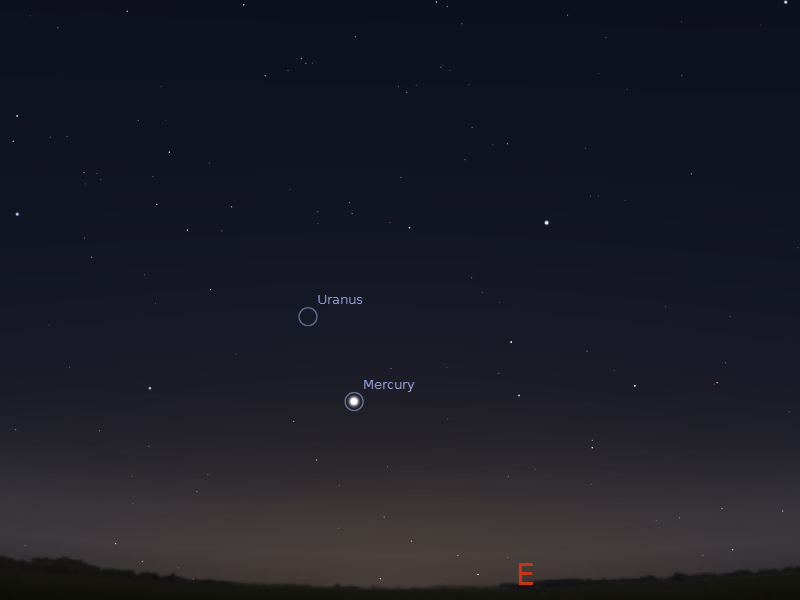 Mercury is now visible above the eastern horizon by 5:30 am in the morning. As the week progresses it will climb higher in the morning sky. 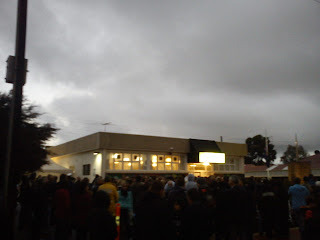 Carnival of Space #243 is now up at The Venus Transit. There's atomic metallic hydrogen, magnetic tornados on the Sun, lots of rocky planets around Red Dwarfs, weird clouds on Mars and much, much more. Zip on over for a read. Left Image: Solar 22 degree halo, right image: Lunar 22 degree halo. On the way back from boogie boarding with the boys, I notices a 22 degree solar halo. These are rare in Adelaide, and I was able to show the exchange students. We took the exchange students out to Schnitzels at the Largs Peir pub. On the way back, the thin high cloud that had made the solar halo had hung around, making a Lunar halo as well (image isn't as good as I had no tripod). Took the Japanese exchange students boogie boarding today, they had a hoot. Saw a 22 degree solar halo as well. Off to the pub for farewell scnitzels, unlikely to see asteroid tonight.